OK, for part 1, I directly copied all the English on the pamphlets, but honestly… I hate doing that. I have been putting off this part of the blog because I dread it. So, forget it… I will stick with the pictures. We got a late start to the day and planned on hitting up Nijo-jo first. From Kinse Inn, we were able to catch JR Tambaguchi station to Nijo station, which was only one station away. Once we got to Nijo station, we kind of goofed off at a game center for a bit. I mean, how can you come to Japan and not play the Taiko game? We first had a little bit of lunch at a raamen chain, and then we hit up Nijo castle proper, and it was such a gorgeous day to do that. This was a popular spot for the tourists, but it’s quite large so it was still pretty comfortable. From there, my friend and I went to check on his other hotel reservation for after I left. Everything was square, so we hit the subway to Higashiyama station and from there we high legged it to Ginkakuji. The pain slowed me down quite a bit, so I was quickly outpaced. I recommended a bus (they are the best way to get around Kyoto), but my friend wanted to see the sights and what lies in between. Even though its Kyoto, the in between spaces look just like anywhere else in Japan. It was new for him, so I didn’t push it and let him go for it. He arrived at Ginkakuji a good 5 minutes ahead of me and by that time, there was only ten minutes before the temple closed. I elected to hang out and wait for him and just go back later. The next day, I hit up Byodoin with my wife, who had arrived early Saturday morning. Byodoin is in Uji, which is about a 20 minute train ride south of Kyoto station. It’s claim to fame is that it is on the 10 yen coin. It was busy but there were many places to sit and relax as well as a very nice museum. You can pay extra to go into the very popular phoenix hall, but we were watching the clock. After we were done with that we went to Arashiyama, which is far to the west of Kyoto station. We took the train and then a taxi from Matsuo-Taisha station. My wife warned that the bus from Kyoto station can take a long time to get there and we risk missing our appointment time for Kokedera. This part of Kyoto is my favorite. A month earlier I made reservations for the moss temple, or Kokedera as it is commonly known. It is formally known as Saihoji. You can’t enter without an invitation, which can only be obtained by a reservation. With a little preplanning, it’s very easy to get that invitation. All you need to do is send a postcard with a prepaid postcard attached with your return address, choose a day and a back-up day and they will choose the day and time for your attendance. It is a steep ‘donation’ of 3,000 yen, but you gain access to the gardens but not before you participate in the reading of the sutras and tracing out arcane kanji. I am glad I went, but I don’t think I will repeat. After Saihoji, we went to my absolute favorite temple in Kyoto. The relatively unknown Jizo-in, hidden within a bamboo forest directly next to Saihoji. What I enjoy about Jizo-in is that it is unassuming, uncomplicated, simple and unconceited. It is a little run down place, but abundant in peace and quiet. We sat for a time and admired the garden while hearing only the wind in the leaves. There were a few people there, but everyone was silent. A mantis walked right up to me, and stayed until we heard the gibbering and chirping of a group of 20-somethings who must have stumbled upon the temple. We took that as a hint, and so did the mantis. I am sure there is a haiku in there somewhere. My wife and I took the bus to Nijo station and from there, went back to Kinse Inn. See that brown box in the center of the picture… That is Kiyomizudera under restoration. nope! On our final day, my wife and I started early and bought a day bus pass, which is the best deal in Kyoto. Basically, you have unlimited Kyoto bus use for 500 yen, so it will pay itself off if you use the bus 3 times in a day. The buses are pretty crowded though, so get used to being squished in there. First we walked to Sanjusangendo, the temple with the hundreds of Buddha statues. No point in taking the bus since it is really close to Kyoto station. 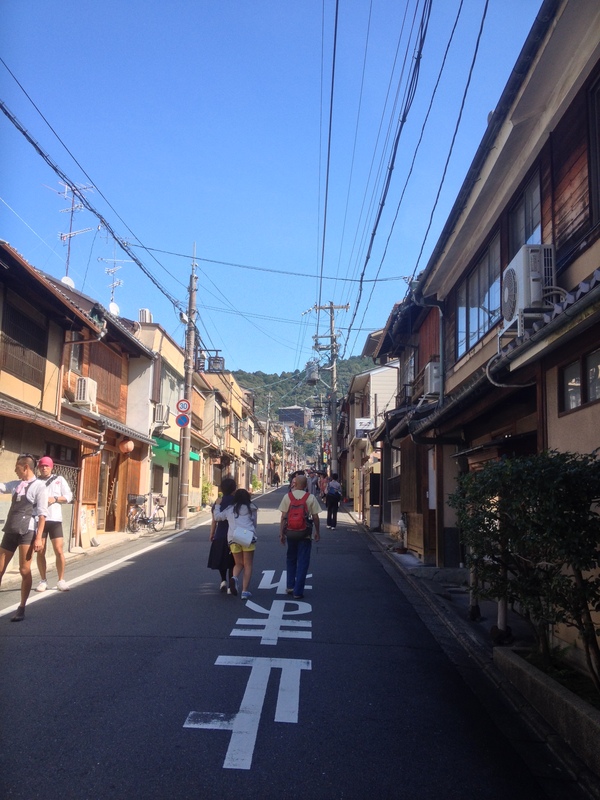 From there we took the bus to Kiyomizudera and started walking along the shopping street. Halfway there we saw that the main pagoda was being restored and waves upon waves of school students were being bussed in. That was our signal to write off that temple. I recognized the kids as the ones from Sanjusangendo, and they were an unruly bunch. The temple officials had to make several announcements asking the teachers to rein in their kids. We deemed that unruly kids by the busload + remodeling= not worth it. So we ate lunch at a cute little café and then hit up Ginkakuji, the sister temple of Kinkakuji. Ginkakuji is by far the more beautiful, possessing a gorgeous garden and city view, whereas Kinakuji is lined with tourists, a pond and a gaudy temple. Not saying that Ginkakuji didn’t have its crowds, but they were compressed at certain photo spots. And that was pretty much it for my Kyoto adventure. Posted in This American Life: JapanTagged byodoin, ginkakuji, Goshuin, Japan, jizoin, kokedera, kyoto, moss garden, moss temple, nijo castle, nijojo, saihojiBookmark the permalink.